Eye Patch Day is May 20, 2014. 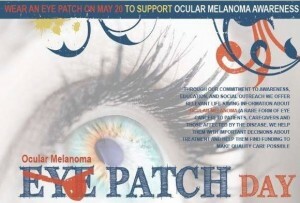 Show your support for eye cancer patients by wearing an eye patch on this day. Cancer tumor test says it can identify, with 97% accuracy, whether your ocular melanoma will spread to other parts of your body. AFTER losing one of his eyes to a rare form of cancer, Ron North is aiming to raise funds – by releasing his own charity single. Music student Ron (26) was diagnosed with ocular melanoma in June 2009. A series of treatments failed and he eventually had to have his right eye removed in September last year. But he is now releasing the single, Do These Words, to raise funds for the Teenage Cancer Trust.